Marc-André​ Fleury made 33 saves, including 30 in the final two periods, to hand his teammates a 4-2 victory and 2-1 series lead in the West final at T-Mobile Arena on Wednesday. The Winnipeg Jets huffed and puffed but couldn't blow the equalizer past Vegas Golden Knights fantastic netminder Marc-André​ Fleury. 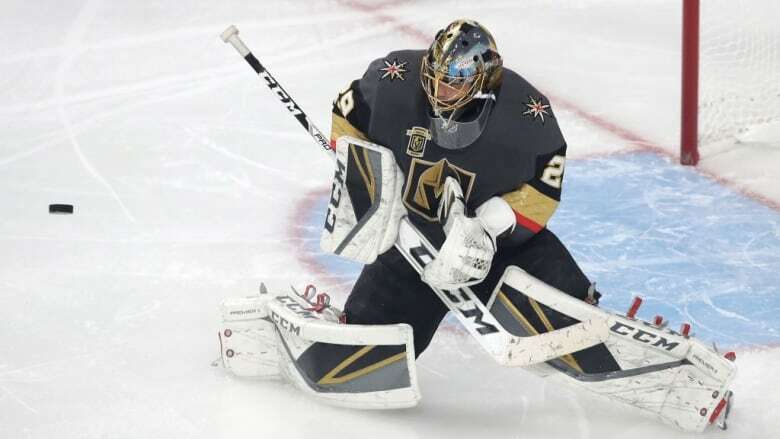 The 33-year-old Fleury made 33 saves, including 30 in the final two periods, to hand his teammates a 4-2 victory and 2-1 series lead in the Western Conference Final at T-Mobile Arena on Wednesday. With the Golden Knights standing around in a frantic third period, trying to protect a 3-2 lead, it was Fleury who made save after save to steal the win. Winnipeg's best player, Mark Scheifele, scored his second of the game early in the third period, but was foiled on back-to-back chances midway through the final 20 minutes. Fleury dove like Superman back into the crease to make the second stop in that sequence. Later, Jets defenceman Dustin Byfuglien was in alone, but was stopped by the man they call "Flower", on a flubbed curl-and-drag attempt. "At that point, it's what we expect from Flower," Vegas sniper Jonathan Marchessault said. "He does it every night. The third period was not good enough for our group. We definitely need to close that game better." Fleury now has a 10-3 record and .945 save percentage in the Golden Knights surprise playoff run. Yes, the smiling assassin was so good he even received a secondary assist on Jonathan Marchessault's empty-net goal. Fleury also found time to give Blake Wheeler a wet-willy in the second period after the Winnipeg captain was pinned to the back of the net by Vegas forward Ryan Carpenter. Before this game turned into the Marc-André Fleury Show, the Jets fell behind 3-1 because of sloppy turnovers. Scheifele turned it over inside the Golden Knights blue line on Marchessault's goal 35 seconds into the game. 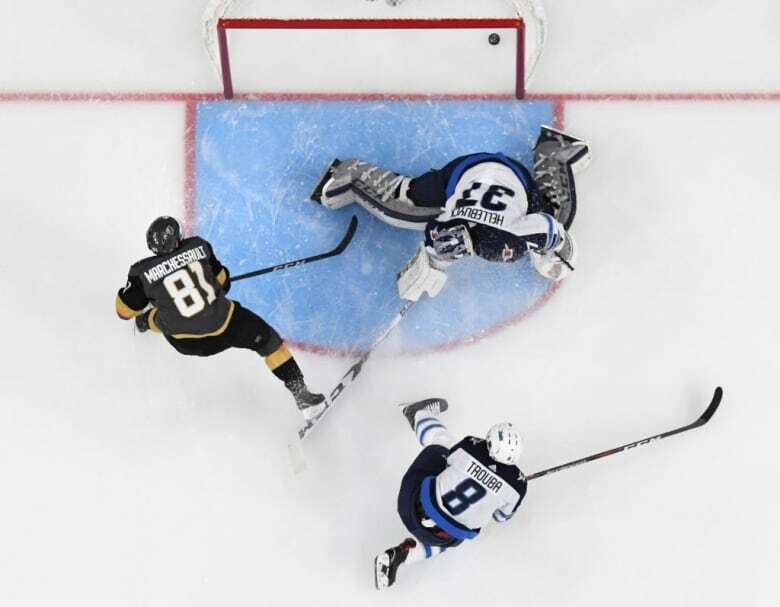 The Jets centre then tied the game early in the second period, but 18 seconds later the Golden Knights went back in front after Winnipeg goalie Connor Hellebuyck coughed up the puck behind his net to Erik Haula, who swiftly found James Neal out front. A few shifts later, Jets rookie left wing Kyle Connor failed to chip the puck in deep. A quick transition the other way and Alex Tuch made it 3-1 as he caught the Winnipeg defence pairing of Byfuglien and Toby Enstrom standing around after a 57-second shift. The Jets were without second-line left wing Nikolaj Ehlers in Game 3. Winnipeg head coach Paul Maurice said he knew in the morning that Ehlers would not play, but refused to elaborate on the nature of Ehlers' ailment. 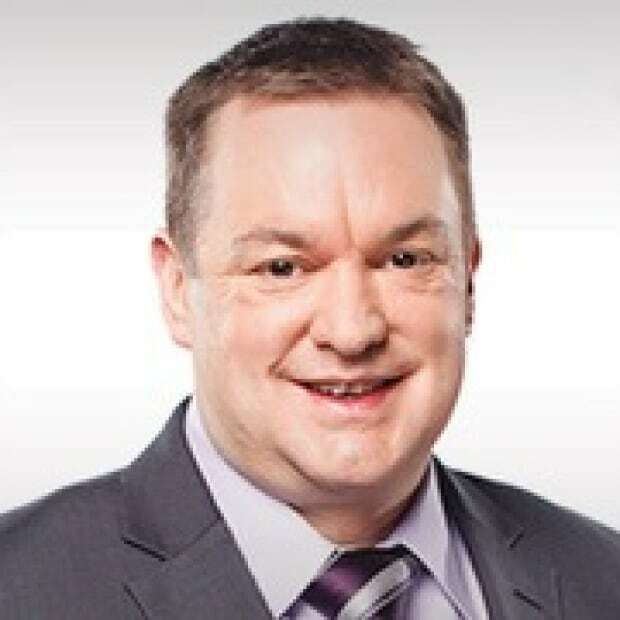 The Jets need more than Scheifele going in this series. He set a playoff record with his 11th away goal. But right now it's only the Scheifele line that is going well, accounting for the last four Winnipeg goals. The upstart expansion Golden Knights, on the other hand, saw both of their top two lines chip in with two goals apiece. This is the first time the Jets have dropped back-to-back games in this playoff run and the first time they fell behind in a series. It will be interesting to see if they can rebound and feed off a dominant third period. They showed hustle and determination in their game in the final 20 minutes to win more one-on-one battles and jump on loose pucks. But how much was that due to the Golden Knights sitting back too much? "We know that was [more like] our game," Scheifele said of the third period. "We just have to harness that for a full 60 minutes."